Today marks the launch of the iPhone SE, which means everybody can now get their hands on the device and start torturing it, especially YouTubers. Zach Straley has performed an iPhone SE waterproof test versus the iPhone 5s and iPhone 6s, which you can check out below. 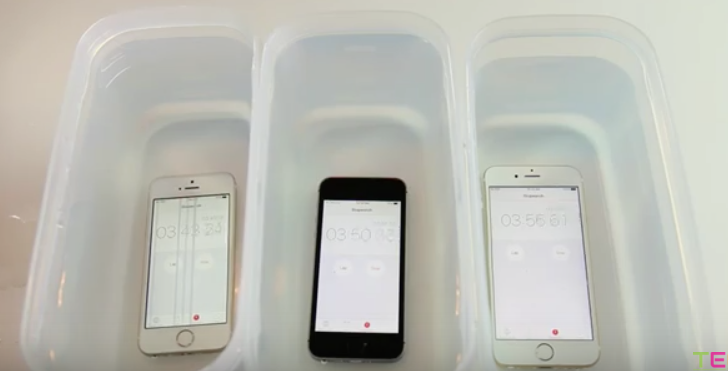 How long does the iPhone SE last submerged in a bucket of water? It was under water for just over an hour and still worked fine, like the iPhone 6s. The iPhone 5s however, didn’t last as long as it fizzled near the start of the test. We know Apple employed new gasket-like sealing within the iPhone 6s according to iFixit’s teardown, which helped with its waterproofing abilities. We’ll have to wait for the iPhone SE teardown, which should be published soon, to see if similar techniques were used. While this was a random waterproof test, it does show if you happen to drop your iPhone SE into water, it won’t go bust immediately.